Spalling refers to a localized fracturing of concrete that occurring along cracks or joints. Several factors contribute to development of spalling in CRCP, but most stem from the presence of pre-existing fractures that are propagated into cracks leading to spall distress. For example, moisture loss and the associated drying shrinkage at the pavement surface, coarse aggregate type, and inadequate curing protection may result in weak concrete near the surface. 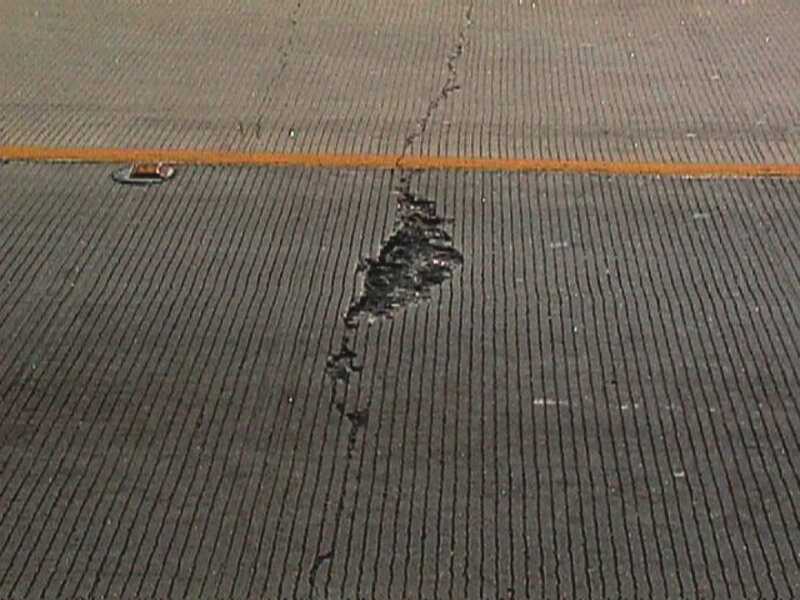 This concrete is more prone to spalling, especially at transverse cracks in CRCP. Early-age horizontally-oriented delamination in combination with slab deflection of the pavement slab under load creates bearing stresses at the crack faces due to the action of load transfer. 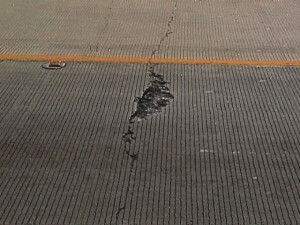 This can cause the concrete surface to spall in a relatively short period of time, and in turn, lead to spalling that is somewhat independent of traffic level. One cause of spalling is the type of coarse aggregates, especially those low in quartzite content (<10% by weight). When these conditions exist, other design factors should be considered to minimize the potential for spalling including the selecting an improved curing method to enhance the strength of the concrete to resist delamination. Using a lower water-cement ratio is a measure that can also be used when river gravel coarse aggregates are used. This reduces the availability of surface water to the gravel materials. Another precaution can be made during concrete batching, where the coarse aggregate can be added as the last component. Finally, another measure that has been effective in preventing spalling is to blend calcareous aggregates with gravel sources which essentially increase the overall early-age bond strength of the concrete aggregate, thus reducing the potential for delamination and subsequent spalling.